What will it be like for my 100th? Know how to throw a good party? 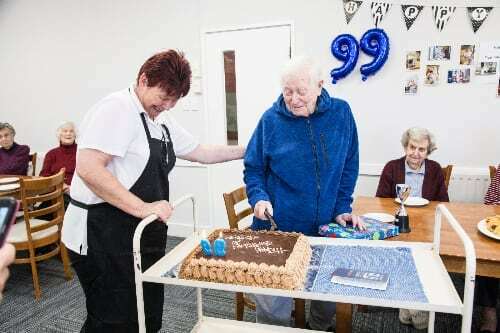 Freeman Court does, and we had a great time wishing Bob Airey a happy 99th birthday. Freeman Court is a part of Habitat for Humanity (Central North Island) and is an affordable place, where local older people can continue to live independently without the stress of managing a household. “Always do your best at anything – do your best for your family, for your work, for everything,” is Bob’s life motto. In fact, Bob retired four times, before he retired officially. Working hard is in his nature, he so he continued going back to work. Born in 1919 in Kent, England, Bob left school at the age of 16 to join the Auxiliary Air Force. A week before war broke out, he was called up to serve his country. This involved serving in the Air Force in England and France for six years during the war. After immigrating to New Zealand, Bob spent 20 years in the NZ Air Force where he held the rank of Warrant Officer. Family is close to Bob’s heart. Collette, his daughter in law, says his French dictionary is well used – he often translates to write to a family he met in Canada while he was working there in 1993. Going back to Canada in 2015, saw him living there for over 15 months. Unfortunately, the cost of insurance was too high and unable to get residence, he had to move back to New Zealand. Reading, crosswords, and shopping – Bob enjoys living at Freeman Court and doing these things. Not to mention, he continues to love his weekly trip to McDonalds – Collette takes him every Tuesday. Freeman Court is part of Habitat for Humanity (Central North Island) and is an affordable place where local older people can continue to live independently, without the stress of managing a household. Freeman Court offers affordable accommodation to older people with a low income and no significant assets. Applications for residency at Freeman Court are inclusive of evaluating the person’s assets and income. The cost of board (rent and services) is subsidised by Habitat. In the heart of Te Awamutu, Freeman Court makes independent living affordable and a little easier for older people. We encourage independent living and wellbeing for as long as possible, within a safe and secure environment. At Freeman Court people live together in a warm, home-like environment.